The Portable Baptistry Thermal Cover (included with every Baptistry) completes the amazing energy efficiency of the Portable Baptistry, helping to maintain a comfortable water temperature for baptism. By floating on the water surface, the Thermal Cover seals up the Baptistry and eliminates air pockets, preventing heat from escaping. 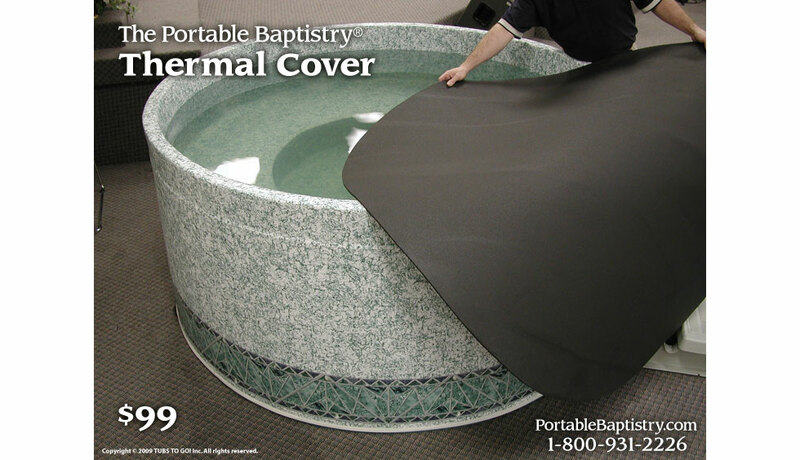 With the Thermal Cover in place, the Portable Baptistry impressively will only lose approx. 6F degrees in 24 hours. Made of special cross-link, poly-foam material, it is lightweight yet extremely durable, and easily rolled up for convenient storing away. Used in conjunction with the Portable Electric Heater, the Thermal Cover is essential for the heating up process. The Thermal Cover is available with or without the handy, CoverCarry Strap for keeping the Cover rolled up when transporting or storing away.